For this article, I am going to break down my sneaker recommendations into 4 categories: Cardio and Running, Strength Training, Everyday Active and Fashion Sneakers. I put a lot of thought into this category as I am super picky when it comes to footwear. I know I personally hate the way the running shoe design is going. I’ll never understand why the idea of a non-detached sneaker tongue is appealing, but apparently it is and everyone’s buying them anyway. This year I must have tried every one of Nike’s new running sneakers. I tried the new Nike Epic React after I saw Simone Biles sporting them. HATED them. I couldn’t even get my foot in the shoe, and I don’t have wide feet. I sent those back. I had even ordered a half size up as the reviews had told me to do as well. I also tried the Nike Free cheetah print sneakers. They were sooooo cute. Again, same problem. Sent those babies back. I decided after that to go try the Lunar Glide series as I had looooved my older lunar glides. I still use them! But again, another bad shoe. I then decided to go back to the Pegasus series and that’s where I finally found my Nike love again. So I got the Pegasus 34s. They are super good for running, but that’s about it. So then then when the 35’s came out, I splurged and got the custom Nike IDs and they were perfect. So, the first picture here is the Pegasus 35s which are my babies. I love them for running the most, but I’ve been known to do Zumba in them as well. They’re really very comfortable and I 100% recommend. I did not size up a size in these either. The Pegasus 35s come in a lot of colors now that they’ve been out awhile. I have these cute grey ones en-route to me as I type! I would use these mostly for indoor use on the treadmill or inside. I’d be afraid of wearing out the bottoms on the road too quickly with these. This second pair below me are the Adidas Ultraboosts. The colors are limited on these as I have always found with Adidas in general. They just don’t offer the wide array of colors that Nike always does. But their shoes are always my favorite. I only use their tennis shoes when I play tennis, no other brand. They are truly made for comfort and they LAST. And that’s what I’ve found true all across the board in Adidas. I never have to cross my fingers and hope my size is the right size when it comes to my door. I’m always an 8.5 in Adidas. These sneakers below, I’d recommend for the runner who likes the streets. They’re a little more grippy but still super light-weight. They seem perfect for those 5k events or longer that are outside. Again, all personal preference. These sneakers are shoes I recommend if strength training is your focus. The first pair here are the Nike Metcon 4s. They have great reviews and also fit very nicely. They come in a bunch of cool colors and definitely do what they say they’ll do. They’re a little on the heavier side so they’re perfect for keeping balance while doing weight exercises. They’re a decent shoe. But if you’re looking for a versatile shoe where you can run/do cardio a bit AND get your strength workout in, I’d suggest the second pair in this category. These, ladies and gentlemen are the Nike Air Zoom Strong 2. (They are currently on sale on Nike.com)! These shoes are great. There’s ankle support, which you do not get from a lot of shoes. They also are a lighter training shoe and that’s hard to find! These shoes offer the ability to switch from strength to cardio very easily. They look good and feel good and all around are an EXCELLENT gym shoe. I’m very sporty so I love comfort and trendy styles. 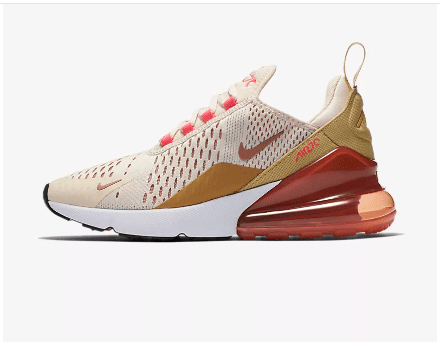 I bought these Nike Air Max 270s from Nike recently. I’ve seen a bunch of people around my college campus wearing these and one of the guys in my graduate class was telling me how they were the “most comfortable” shoes he had ever tried on. The air feature this shoe has absorbs all of the ground to foot vibration leaving you with the smoothest ride. I bought these for the sole purpose of my upcoming trip to China and climbing The Great Wall. (Someone told me we are doing 7 miles on the Wall, so I am ready with these bad boys). I have to say, they are a little stiff at first, but give them some time. They are ultimately butter for your feet. They are clearly very good for your feet too as the cushion and insulation is unmatched by any other shoe. This shoe is great for people who are on their feet all day, or are just looking for some comfort. I know when I wear these I find myself walking further than normal. At this point, I didn’t realize my love for Nike until I got this far writing. I promise, I am in no way affiliated with the company. I just find a lot of styles they have are unique. Especially this first one below. This one was a special edition I had to have. They are called The Force is Female Nike Air Force 1s. These are the most comfortable everyday shoe/boot/sneaker I own. I love them and this color is so badass. They have The Force is Female written all over the shoe which is so cool. I love them, and they look great with leggings and jeans too! Perfect fall/winter/beginning of spring shoe!!! Here’s an Adidas sneaker I own. I love these. I have them in a stone pink color. Currently they only have this color and black. These are called the Adidas Tubular sneaker. They run large, I actually wear a size 8 in these (even with a sock). I tuck the laces in like this girl has going on in the picture below. They are extra wide and comfy. Super lightweight and I could definitely run in them if I chose. They remind me of Yeezy sneakers (which is a branch of Adidas). I love these with leggings or workout gear just for everyday use. These are an essential. Everyone should have a pair of these. These are the high-top Converse. White seems to be the most popular color these days among girls and women, but they come in ALL the colors you can imagine. You can also create your own Converse these days as well. These are comfortable, classic and timeless. These will never go out of style. They’re also only $55 dollars.